Barack Obama has kept a notably low profile since departing the presidency in January 2017, only occasionally weighing in on political affairs to advocate for his most cherished initiatives, like the Affordable Care Act and the Iran deal, as President Trump attempts to dismantle his legacy. But on Tuesday, he delivered a major address in South Africa defending the liberal international order and condemning the politics of division. 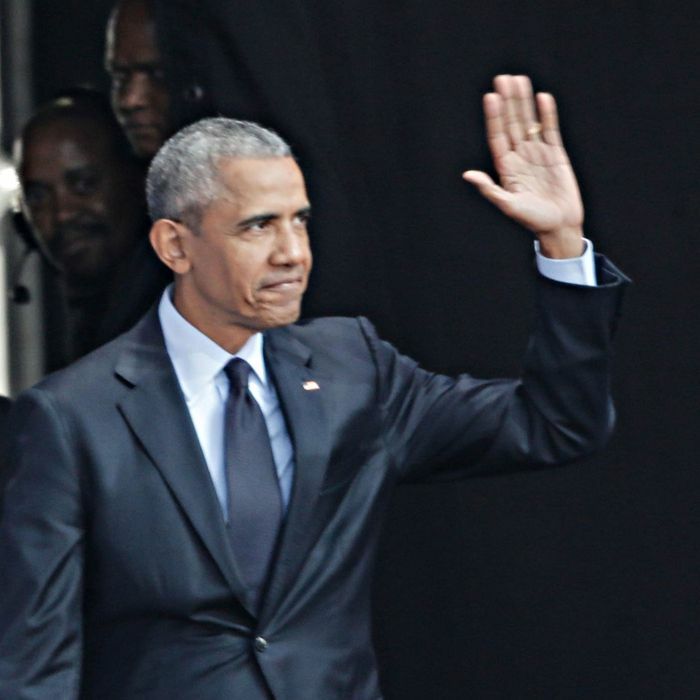 Speaking to a crowd of 15,000 people at a Johannesburg cricket stadium to mark what would have been Nelson Mandela’s 100th birthday, Obama recounted human progress over the last century, lauding the advancements that have been made on social, racial, and economic issues in America and abroad. And he warned against the kind of tribalistic tendencies, now ascendant in much of the world, embodied by President Trump — though he pointedly did not mention his replacement’s name. “People just make stuff up. They just make stuff up. We see it in the growth of state-sponsored propaganda. We see it in internet fabrications. We see it in the blurring of lines between news and entertainment. We see the utter loss of shame among political leaders where they’re caught in a lie and they just double down and they lie some more. It used to be that if you caught them lying, they’d be like, oh man — now they just keep on lying. “The politics of fear and resentment and retrenchment began to appear. And that kind of politics is now on the move. It’s on the move at a pace that would have seemed unimaginable just a few years ago. In another notable passage, Obama appeared to endorse a universal basic income, saying, “It’s not just money that a job provides. It provides dignity and structure and a sense of place and a sense of purpose. So we’re gonna have to consider new ways of thinking about these problems, like a universal income.” Obama had been cool to the idea of a universal basic income in previous remarks on the subject in 2016. The South Africa speech may serve as a preview for the fall, when the former president is expected to play an important role for Democratic candidates ahead of midterm elections.